Home / Media Centre / What Causes Painful Periods? Some discomfort and pain is perfectly normal during menstruation, but excessive pain that affects your daily activities could be an indication that something is not right. secondary dysmenorrhoea, which occurs in women who have had normal periods that have developed into painful periods later in life. This is often caused by an underlying condition like endometriosis or uterine fibroids. So, what causes painful periods? And how can they be treated? Sometimes, there are no identifiable causes for very painful periods. There are, however, certain risk factors that can increase the likelihood of one suffering from particularly uncomfortable menstruation. Some of these risk factors include having a family history of painful periods, heavy bleeding, irregular periods, smoking, being under the age of 20, and never having had a baby. Painful periods can also be caused by an underlying condition, such as endometriosis. Endometriosis is a condition in which cells from the lining of the uterus spread into other areas of body, such as the ovaries, pelvis, and fallopian tubes, causing considerable pain and discomfort. Fibroids on the uterus may also cause pain during menstruation, as the growths place pressure on uterus, and can also cause abnormal menstruation. Another condition that may cause painful periods, pelvic inflammatory disease (PID), refers to an infection that affects the uterus, fallopian tubes, or ovaries. In many cases, the disease is caused by inflammation-causing bacteria that is sexually transmitted. In rare cases, a condition known as adenomyosis may be the cause of painful menstruation. The condition causes the uterine lining to grow into the muscular wall of the uterus, leading to inflammation, uncomfortable pressure, and pain. Another rare condition known as cervical stenosis occurs when the cervix is too small for proper menstrual flow. Menstrual flow is slowed down, causing increased pressure and pain in the uterus. There are several home treatments that can help to relieve some of the pain and discomfort, but it is important to seek professional help if the pain of menstruation is preventing you from carrying on with your day-to-day activities. Let Dr Wallman know if you experience sudden cramping and pelvic pain, as these could be signs of an infection which should be treated. If you pass blood clots, experience pelvic pain when you’re not menstruating, and have had at least three very painful periods, don’t hesitate to come in for a consultation. Dr Wallman will perform a thorough examination and may conduct some imaging tests (such as ultrasound and CT scans) in order to determine the cause of your pain, and diagnose any underlying conditions you might have. Treatment will depend on your specific symptoms and whether or not you are suffering from an underlying condition, but Dr Wallman will be able to advise you of the best plan for your needs. Treatment may include the use of medications, such as pain killers, hormonal birth control, and anti-inflammatory drugs. 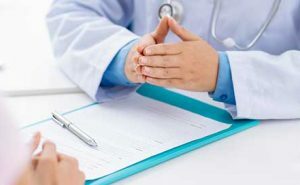 In some cases, surgery may be an option, particularly if Dr Wallman has diagnosed you with a condition such as endometriosis or uterine fibroids, and other treatments have been unsuccessful. Dr Wallman is passionate about helping women overcome painful periods. Once he has identified the factors that are causing your discomfort, Dr Wallman will formulate a treatment plan that will manage and treat your health concerns. If you’re interested in learning more about painful periods, or would like to book an appointment with Dr Wallman, please contact us today.